My name is Erin Cabatingan. I am a wife of one and a mother of three. I live in Southern Utah. My favorite color is yellow. I'm writing this blog to detail the progress of my very first published picture book (!!!!!) and other books to come. Lots of fun things have been happening lately, but first a quick history. About nine years ago I decided I wanted to write and publish children's books. For the next several years, I wrote and sent my work out to publishers. No one was interested. :( About four years ago, I got more serious about writing and started going to writer's conferences and workshops and I researched writing and publishing on the web. As I did more research, I decided that I wanted an agent so I started sending out my work to different agents. About three years ago, Nancy Gallt called to tell me she wanted to represent me and not much later she found a publisher--Neal Porter at Roaring Brook Press--for my manuscript, A is for Musk Ox. 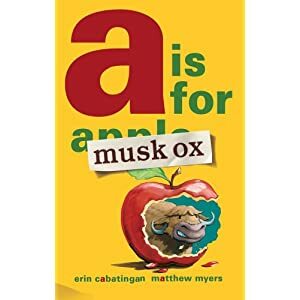 A is for Musk Ox comes out October 16 (make sure you buy it) and I already have two other musk ox/zebra books under contract. The next one is called Musk Ox Counts. I received my first hard copy of A is for Musk Ox! It's so much fun to hold the actual book in my hands. The illustrations are awesome (I didn't do them--I wish I was that talented of an artist) and I love the layout of the book. 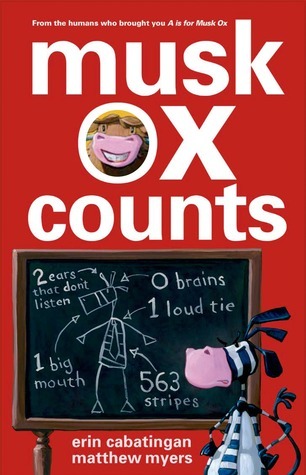 I got to see the cover of my next book, Musk Ox Counts. Getting to see finished artwork for the first time is always exciting. It makes my book seem more real and it's interesting to see how the artist interprets the story. It's not quite what I had in mind as I was writing it, but in this case, that's a good thing. The illustrations add so much to the story and make it even more fun. The artist is Matthew Myers by the way. He's incredibly talented--you should probably go check out his website. I also got to see my book trailer. I was very excited about this because I've known several authors who have had to make their own and I have absolutely no talent in that area. I would have had to pay someone to make one for me, so I was very glad my publisher did it for me. If you'd like to see it, go here. There was also an ad in Publisher's Weekly, which was fun to see. And some other news, that wasn't as fun as it could be: I got my first review from Kirkus. This was actually pretty hard for me because they said some not-nice things. Overall, the review was decent--they did say some good things--but of course the only thing I saw when I read it was the negative. It took my husband a little bit of time to finally convince me that it wasn't the worst review in the world and that people will still want to buy my book.